Our new Naturally Active Tonics are perfect for Apple Cider Vinegar enthusiasts who are looking for the added benefits of supportive spices and herbs. They also provide an easy solution for incorporating Apple Cider Vinegar into your daily routine. We have crafted combinations of Apple Cider vinegar with natural, healthy ingredients to create versatile, flavoursome and healthy tonics. Our Apple Cider Vinegar Echinacea Soother Tonic is an uplifting combination of raw, cold-pressed, organic apple cider vinegar and honey, with specially selected health and wellness herbs - Echinacea, Garlic and Ashwagandha (Ginseng). This supercharged Apple Cider Vinegar Tonic contains ‘The Mother’ enzyme, a living mixture of beneficial bacteria and minerals only found in authentic, natural, high quality vinegars. A soothing but refreshing pick-me-up your body will thank you for. Organic Apple Cider Vinegar (79.8%), Honey, Garlic powder, Clove powder, Echinacea extract (0.09%), Ashwagandha extract. Store at room temperature. Shake well before use. Do not use if tamper evident seal is broken or missing. Our Apple Cider Vinegar Fire Cider Tonic is an invigorating combination of raw, cold-pressed, organic apple cider vinegar, horseradish, turmeric, chilli, ginger and pepper, balanced with honey for a well-rounded flavour. 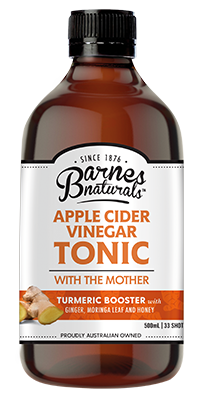 This supercharged Apple Cider Vinegar Tonic contains ‘The Mother’ enzyme, a living mixture of beneficial bacteria and minerals only found in authentic, natural, high quality vinegars. It’s a stimulating, spicy kick that will keep you coming back for more. Organic Apple Cider Vinegar (78.8%), Honey, Turmeric powder, Ginger powder, Chilli powder (0.2%), Horseradish powder, Black pepper. Our Apple Cider Vinegar Turmeric Booster Tonic is a revitalising combination of raw, cold-pressed, organic apple cider vinegar and honey, crafted with specially selected antioxidant ingredients - Turmeric, Ginger and Moringa Leaf - traditionally used to support health and wellbeing. This supercharged Apple Cider Vinegar Tonic contains ‘The Mother’ enzyme, a living mixture of beneficial bacteria and minerals only found in authentic, natural, high quality vinegars. Give your body a little boost and revitalise your senses with this deliciously zesty combo. Organic Apple Cider Vinegar (78.8%), Honey, Turmeric powder (0.6%), Ginger powder, Cinnamon powder, Moringa leaf extract, Black pepper.